Posted 6/17/2011 10:01pm by Sam Bellamy. Posted 6/13/2011 8:39am by Sam Bellamy. Blueberry field will be open Wednesday June 15, 8 m to 9:30 am. The next open date will likely be this Friday or Saturday so watch closely. If you are interested in Organic potatoes, squash or cucmbers now is a good time. Please call or email ahead in order to set some aside for you. The peaches have been good. The Ruby Prince variety has been very sweet as it ripened. The Red Haven peaches will begin this later this week. They are freestone peaches. All our peaches from that point forward will be freestone peaches. Heirloom tomatoes are beginning to come off the farm now! The beans continue to be good. Warmer weather beans such as the limas and field peas are beginning as well. I am very glad to see watermelons and cantaloupes getting some size. It should not be too long before we have our own. Posted 6/5/2011 1:34pm by Sam Bellamy. We are thankful for the interest in blueberries and blackberries. We will open the blueberry field for Saturday June11 .The times will be 8:00am to 10am. The blackberry field may be open that morning . We should know by Thursday evening. We need to wait a little more to see. Watch the web site this week to see what happens. It is possible that we could have a morning open for blueberry picking before Saturday. It will depend on the fields. The heat really can change ripening projections. We are definitely planning on Saturday, June 11. We are picking some nice beans! Now is a good time to get them. If the weather continues with extreme heat ( over 90) it reduces the quality of the beans. That is one of the benefits from evening rains. It helps cool down the plants and relieves stress. We have just begun to pick some corn. Peaches are coming in off the farm. 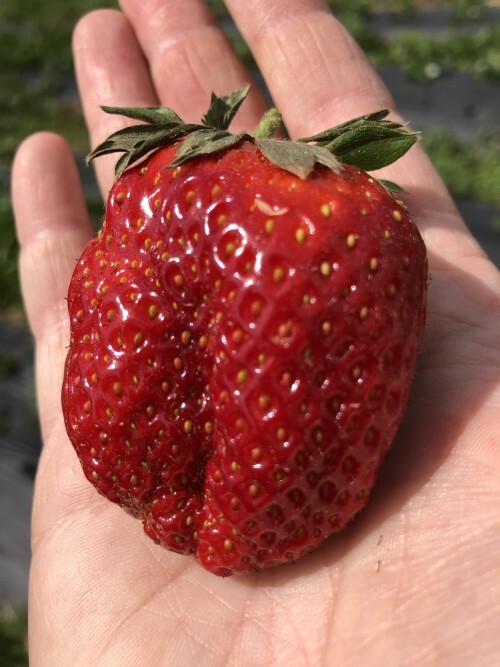 Ruby Prince is now being harvested . Red haven is the next variety then Carolina Belle, Norman, Winblo , Georgia Belle, Sun Prince, Elberta and Jefferson. Beginning with Red Haven the varieties from then on are free stone peaches. Carolina Belle and Georgia Belle are white peaches. Tomatoes are just beginning as well. Posted 5/26/2011 5:39am by Sam Bellamy. Cathy Perry will be spinning and discussing natural dyes including her work with indigo. Barbara Fyre will be providing dulcimer music as well. Over the years I have come to value people who have skills and knowledge, especially first hand knowledge and experience. I encourage you to take advantage of the opportunity to learn from individuals who are willing to share. Posted 5/22/2011 5:04pm by Sam Bellamy. Peaches and Blackberries now coming in!! This is earlier than I expected. There are still strawberries that we are picking for the market as well. Climax , Premier, Delight, Southland, Powder blue, Bright blue, Garden blue, Centurion. The season could begin early so keep checking the web site or sign up for emails to be sent to you. It is the best way to know what is happening with pick your own. The Premier ripens a week or so after Climax begins. It is a very beautiful berry that is excellent in flavor. The southland is good also but much later. One of the later varieties is garden blue. It is distinctly different from the other varieties in that it is smaller, very dark and very sweet. It is not a commonly grown variety but we have people who particularly like it. I recall Dr. Mainland walking through the field with no fruit on the plants identifying each variety as if they were his children. When he came to garden blue he was pleased to know we were growing it. You probably are not aware that we have had some World Class people working with blueberries right here in our southeastern NC. Blueberries are one of the crops that belong to the region and we can grow some excellent fruit. This is good because the small fruits ,in particular blueberries and blackberries are extremely good for your health. Posted 5/20/2011 11:30am by Sam Bellamy. Cathy Perry will be at the farm spinning and talking about dyes. She has created some very intersting shades, hues and colors with natural dyes. For many years she has worked with indigo and is able to talk about it's history. She will be at the farm in the middle of the day. For more information call the market (843-399-6902 or910-287-6 794) or email. Updates on Pick Your Own & more! Posted 5/20/2011 11:21am by Sam Bellamy. I now know that we will not have the strawberry field open for pick your own this year. It is possible we may have a day or two for picking on the honor system. I will email those on the email list if we do. Good news! The Derby peaches are just about ready to harvest! What makes this really good news is that it comes earlier than I predicted. ( almost 10-15 days early) It not only means we have peaches earlier but most likely the pick your own dates will be earlier for blueberries and blackberries! If you subscribed for future emails you will be notified before we pick and get weekly updates during the growing season. This is really to your advantage because in the people on the email list are the ones who know first. Now is the time for garden peas. Wax beans, green beans, broccoli ,lettuce are in strong season. We have organic broccoli, lettuce, turnips, kale, cabbage, potatoes and dandelion plus other produce. If you want organic produce I strongly suggest you email me in order to make sure it is in the market when you are there. More good news! Cathy Perry will be back at the farm spinning and talking to people about dyes and dyeing. She is very experienced and has created some interesting results working with natural dyes. She has blended different dye material to create shades, hues and bright colors. Posted 5/15/2011 10:20pm by Sam Bellamy. The berry supply is shorter than I had hoped for. Right now we need all the strawberries for the market. This does not mean we won’t open the field for Pick your own but if we do I do not know when yet. Please bear with us. I will email if we open the field at least the day before. In the meanwhile, the high bush blueberries should begin harvest this week. Pick your own will be in the rabbiteye blueberries about mid June. Blackberries will begin soon as well. Our peaches are about 2-3 weeks away. We do have some very nice early peaches from Spartanburg, SC in the market now. Asparagus is winding down. If you want to get fresh asparagus do it very soon while we are still picking. Posted 5/11/2011 2:00pm by Sam Bellamy. Posted 5/8/2011 9:56pm by Sam Bellamy. The fields have really been through some changes. The heavy crop that was so prevalent a week ago is now past but the much cooler nights of last week has made a difference also. The nights are warming up now and I am hopeful that the fruit will be more plentiful. The fruit may not be as easy to pick nor as large but the sweetness is the best of the season. The hard part is to know how to manage the field for PYO. The field will be open Monday 8 am to 12 noon. I think it will reopen Wednesday morning and aim to be open Friday ( half day?) and Saturday. The weather and the fields will play a factor in the final decision. Please call or check the website for more up to date information. Please note that we are buying rhubard from Columbia. Rhubard does not grow well here. However it makes great pies with strawberries and blueberries. So now is the time to get it while it is available. When the rhubard season ends it is very rare to have it. Ask Sarah about it if you shop the Myrtle’s Market at 10th avenue.